Are you planning to participate in a pet parade with your dog? Or maybe you’ll be entering a pet Halloween costume contest this year. Here’s a word of advice: make make sure that your dog doesn’t mind being dressed up first… several days before the big event! Trying to get a dog to wear clothing (or a Halloween costume) can sometimes be tricky. Your dog may not like the feeling of wearing a strange, bulky outfit. Not to mention the fact that some dogs don’t even like wearing clothes at all. Must read: Do Any Dogs Really Need Sweaters Or Coats? Your first step is to simply get your dog used to wearing things. Start with very basic items, like a hat, sunglasses, or hair ribbons. You don’t have to go out and buy these things. You can experiment with your own items because you’re just trying to get your dog used to having things on him for short periods of time. He won’t be playing with them on his own. As with any form of dog training, be sure to use your dog’s favorite treats and praise even for very short periods of sitting still with the item on. From there, try a t-shirt (either a doggie-sized one, or a small child’s shirt) and/or a pair of shorts (again, made just for dogs or a child’s pair). Again, give treats and lots of praise for every little bit of improvement toward keeping the item on without pawing at it, biting it, or running away. Finally, depending on how far you want to take it — or what’s included with your dog’s costume — dog boots take some extra time for most dogs to get used to. I recommend getting your dog used to wearing a soft, comfortable pair of child’s socks before trying doggie footwear that is bulky or confining. TIP: My dog is pretty easy-going and he will sit through just about anything you put him through — from trimming nails and brushing teeth to wearing hats and sunglasses . But… the dog boots we bought for him to wear in the winter definitely took the most time to get used to. It was a gradual success, rather than an overnight success. You might want to try just the front paws or just the back paws first. My dog did better when we went all out and put socks on all 4 paws at once. Here are the best tips for training your dog to wear clothing and other things. Depending on the dog, it could take anywhere from 1 day to many months of trying to get your dog comfortable with wearing clothes. In the end, if your dog just doesn’t like wearing clothes, then don’t force him to wear them. That will just stress out your dog and lead to other problems. As long as you use positive reinforcement and experiment with simple items of clothing first — as mentioned above — you should be able to get your dog to wear a Halloween costume in no time. 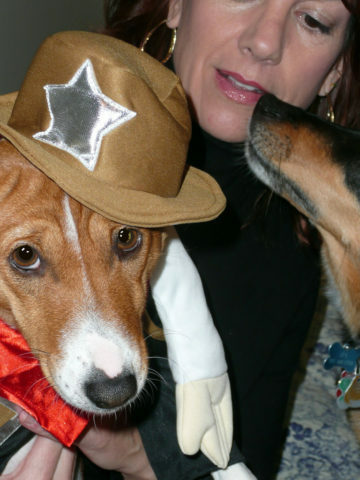 Here are the best tips to follow if your dog is going to wear a Halloween costume. As with any item of clothing, it could take several days or several months before your dog is comfortable with wearing a costume. It all depends on the dog. Please… if your dog just doesn’t like wearing the costume you bought or made for him, don’t force him to wear it. Doing so will really stress out your dog and won’t be fun for anybody — you, your dog, or the people & dogs around you. Dog bandanas – Not all of them must be folded & tied; some are actual dog collars, so they’re less restricting and feel like your dog’s own collar. Fun Halloween dog collars – These have fun decorations and sayings specifically about Halloween. Again, most dogs are used to having collars around the neck area. Dog Halloween toys – Maybe your dog will carry one around, or you could just carry them in your arms with your dog or place them in your dog’s stoller. the only color. Pink dog dye and green dog dye work wonders on the right dogs! Plus, you don’t have to dye all of your dog’s fur… maybe just some ‘highlights’ would be fun. Banners, signs, jewelry – Hung loosely around your dog’s neck, the right combination of items could make a unique look or statement. But don’t take your eyes off your dog while wearing the bling — because those items could become strangle your dog if they get caught on something — like my dog’s chain collar did! TIP: My personal recommendation for dogs that don’t like wearing costumes is to keep practicing with a basic dog Santa hat. It’s simple. It’s festive. And while your dog may not win any pet costume contests, once your dog gets accustomed to wearing it, you can get 2 holidays of use from it — Christmas and Halloween! There’s nothing wrong with a dog going as a simple Santa Claus (or would that be Santa Paws?) for Halloween. My dog did one year. Haven’t found a Halloween costume for your dog yet? Here are lots of fun DIY Halloween costumes you can make for your dog! These are our favorite dog Halloween costumes you can buy. Here are the ones that consistently rank in the top dog Halloween costumes.